Economy plain unprinted stretch style closed back (4-sided) flame retardant table cover for a standard 8 foot exhibit table (96” wide x 30” deep x 29” high). The entire cover is white economy spandex polyester fabric and is not custom printed. 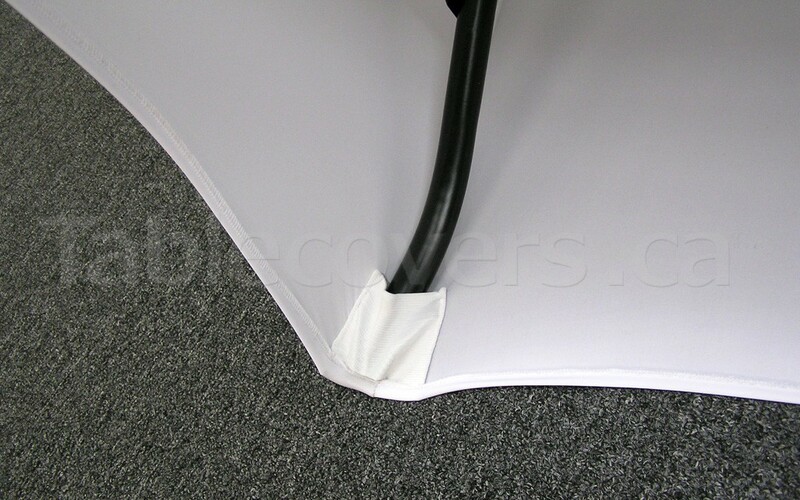 These closed back (4-sided) economy flame retardant spandex table covers are made from polyester / spandex fabric with a flame retardant coating to meet NFPA 701 fire code regulations. Our table covers are machine washable for easy care, and have professionally serged edges sewn all around so the edges won't fray. They are 4-sided throws, so they are ideal for centrally-located tables which will be viewed from all directions. 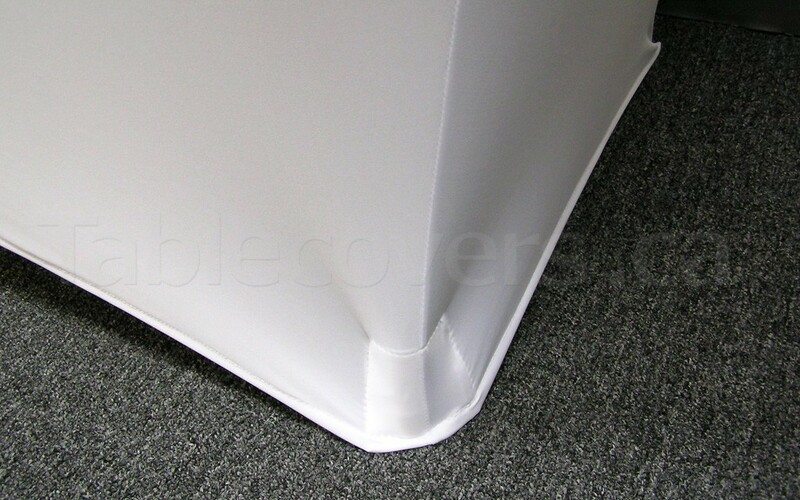 The fabric covers the top, front and sides and also extends down the back of the table, providing some covering for unsightly items stored under the table. 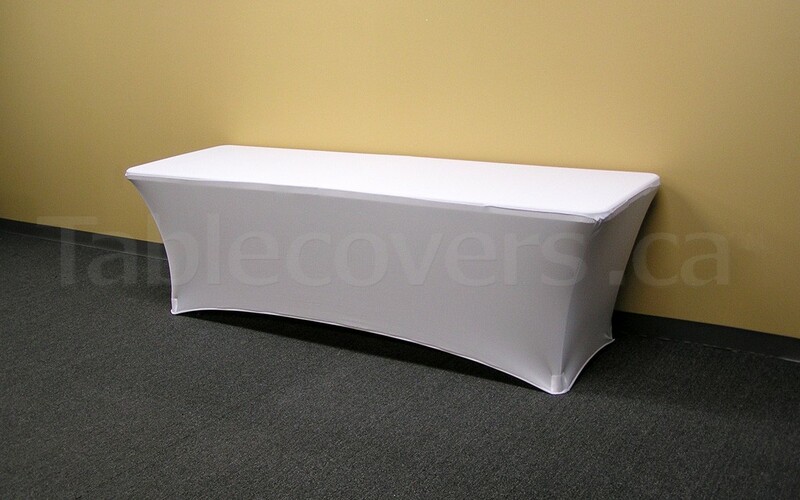 We stock economy unprinted spandex table covers in sizes to fit 6 foot or 8 foot wide rectangular tables as well as high boy round cocktail tables. This model is made to fit a standard 8 foot folding table which is 96" wide by 30" deep by 29" high. 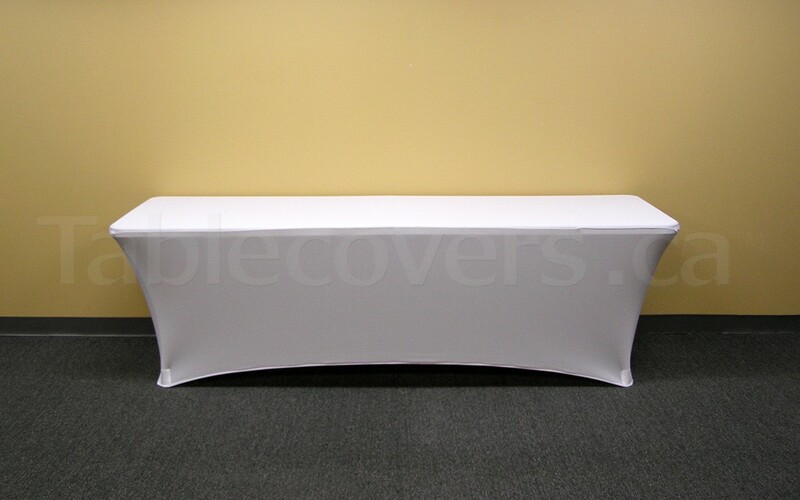 We also have covers for 6 foot wide tables. Since they are an economy model there may be some minor size variation between covers. They won't fit as perfectly as our premium custom-made Stretch Fit spandex table covers but they are generally designed to fit on standard exhibit tables. These economy plain unprinted spandex table covers are usually in stock and ready to ship the next day. They are available in your choice of 2 plain colours: White or Black, to complement most exhibit environments. Please note that these are plain table throws that are made overseas and imported by Signs Plus. To add corporate logos and branding to the table, just add a Custom Dyed Table Runner (sold separately), Custom Dyed Stretch Fit Spandex Table Topper Cap or order a Custom Printed StretchFit Spandex Table Cover.